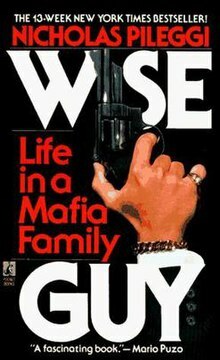 Wiseguy: Life in a Mafia Family (ISBN 0-671-44734-3) is a 1985 non-fiction book by crime reporter Nicholas Pileggi that chronicles the life of Henry Hill; a mafia mobster who turned informant . The book is the basis for the 1990 Academy Award-winning film Goodfellas directed by Martin Scorsese. Henry Hill began his life of crime at age 11 in 1955, by working as a go-fer for Paul Vario, the local boss of Hill's working class Irish/Italian neighborhood. Eventually Hill was "promoted" to selling stolen cigarettes for Vario. Hill was first arrested in 1959, for using stolen credit cards. Hill refused to cooperate with the police, earning the respect of Vario and Vario's associate Jimmy Burke. In 1960, when Hill was 17, he enlisted in the United States Army, to everyone's surprise. When questioned about his decision by Vario, Hill explained that he wanted to please his father, who disapproved of his son's association with the Mafia. While stationed at Fort Bragg in North Carolina, however, Hill continued his criminal activities, which led to his discharge in 1963. He returned to the streets of New York, where he was happily welcomed back by Vario and Burke. In 1964, Hill met Tommy DeSimone, aka "Two Gun Tommy," a young aspiring gangster with psychopathic tendencies, and both worked as stick-up men for Vario, hijacking trucks and selling the stolen goods on the street. In 1965, Hill reluctantly joined Paul Vario Jr., Paul Vario Sr.'s son, on a double date, where he met Karen Friedman Hill, a young Jewish girl from the Five Towns section of New York. Hill and Friedman continued to date, and they eloped only four months after meeting. They had their first child, Gregg, in 1966, and a second, Gina, in 1968. In 1969, Hill began an affair with Linda Coppociano behind Karen's back and bought a restaurant/lounge called The Suite. It was here that, on June 11, 1970, Burke and DeSimone murdered William "Billy Batts" Devino, a made man with the Gambino crime family and a close friend of fellow mobster John Gotti. In 1978, Jimmy masterminded a robbery of the Lufthansa cargo terminal at John F. Kennedy International Airport. The heist was carried out by Hill, DeSimone, Robert "Frenchy" McMahon, and Montague Montemurro in December of that year. ^ Patrick, Vincent (January 26, 1986). "NOT-SO-ORGANIZED CRIME". The New York Times. ^ "Goodfellas (1990) Awards". The New York Times. ^ Canby, Vincent (September 19, 1990). "Goodfellas (1990) Review/Film; A Cold-Eyed Look at the Mob's Inner Workings". The New York Times. This page was last edited on 13 October 2018, at 10:16 (UTC).